One corner of paper slightly dented. 25 sheet box comes with bonus 13 sheet box. We have two A2 boxes of this paper which have a small dent in one corner (of all sheets) due to damage during transit. If you are framing with a mount this will be completely covered, or you could trim the paper down. One 25 sheet box usually sells for $215, but we are selling a full box of 25 plus a partially used box containing 13 sheets for just $150. 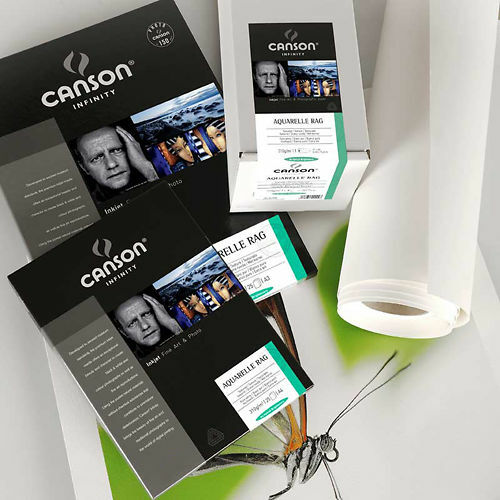 Canson Infinity Aquarelle Rag is the world's number one mould made art paper, and this is the lighter 240 gsm weight, digital form of this classic. Walk in to any art supply store in the world and you'll almost certainly see Aquarelle. It's a classic mould made art paper favoured for watercolours (being mould made it gets it's texture from the mould - giving it a regular grid like and moderate level of texture - enough to add interest but not so much as to impair fine details. The digital version is identical to the art paper except of course for the fantastic ink receptive coating that allows this paper to be a wonderfully expressive inkjet paper. Hand curated articles, links and downloads to help you get the best from your Canson Infinity Aquarelle Rag 240gsm Clearance.